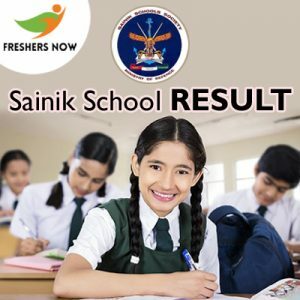 Sainik School Result 2019 is Out..!! on the official site of the Sainik School Society @ sainikschooladmission.in. So, all the Class VI and Class IX candidates who have taken part in the All India Sainik School Examination 2019 can check this page to find out the actual Sainik School Exam Result. Furthermore, we have given you with the updated information of the Sainik School Entrance Exam Results 2019 in each section. Moreover, you can also get the Combined Select List Of Categories For Class VI, Class IX along with the AISSEE Merit List 2019. 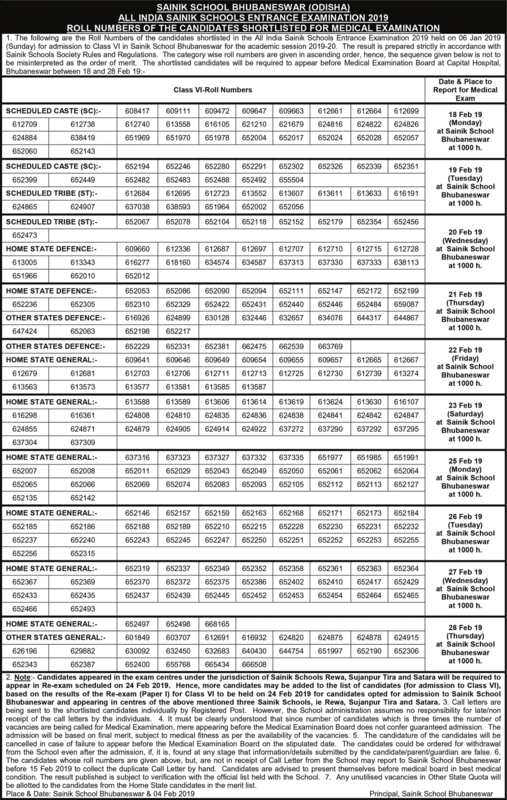 Observe the direct links given for each state in the tabular form from the end of this page. 1.3 What After Sainik School Result 2019? An official notice of Sainik School reads, “More candidates may be added to the merit list of Class VI based on the results of the reexam to be held on 24th February 2019 for candidates appearing in exam centers of three Sainik Schools viz SS Rewa, SS Satara, and SS Sujanpur Tira.” A medical examination is likely to be held from 11th February 2019 onwards. The PDF released on the website carries a list of roll numbers of candidates who have qualified for the admission. The selected candidates are shortlisted for the next phase of exam i.e., the medical examination. NOTE: The school does not patronize any coaching institute/ agent and the admission will be strictly in accordance with the merit of the candidate based on the marks scored in the Entrance Examination, subject to medical fitness. approved by the competent Medical Board. Candidates those who have qualified in the AISSEE 2019 held on 6th January 2019 can only have the chance to attend to the medical examination. Moreover, the medical test involves a medical fitness test which is conducted at the venue itself and the whole body screening which is usually done at army hospitals. The final Sainik School Exam Result 2019 or the AISSEE Merit List will be prepared based on scores of both the written test and medical test after which candidates finally get admission into the Sainik School Society. Thirdly, age would be taken into consideration. The boy younger in age would be selected. Follow the below instructions to check the Sainik School Exam Results 2019 online from the official site. Or you can easily get them from the below table. Click on the state-wise link for Sainik School Exam Result given below in the table to check the merit list or directly click on the link given below. Or else, you can easily move to the official site of the Sainik School Society @ www.sainikschooladmission.in. Enter the candidate application form number and also the password. Click on the login tab to access the webpage. Download the valid result and then save it. Take a printout and keep the same for future reference. The following is the combined list of selected candidates category-wise in the order of merit (row-wise) for admission into Classes VI and IX for the year 2019-20 into Sainik School Society. Moreover, the AISSEE Merit List is prepared without taking into consideration “Medical Fitness” of the candidates. Unfit candidates are being informed individually.